back in high school, i developed an odd fascination with baking. specifically, i used to make bread in the middle of the night when i was in a particularly pensive mood. mom would occasionally awaken to a loaf or two on the kitchen counter, a testament to my restlessness. to this day, i find baking to be a most calming activity. my kitty is not feeling well. he's spending a couple days at the vet's, and i'm hoping it goes well as my sanity is wrapped up in that chubby ball of fur. if ever a moment called for therapeutic baking, it is now. 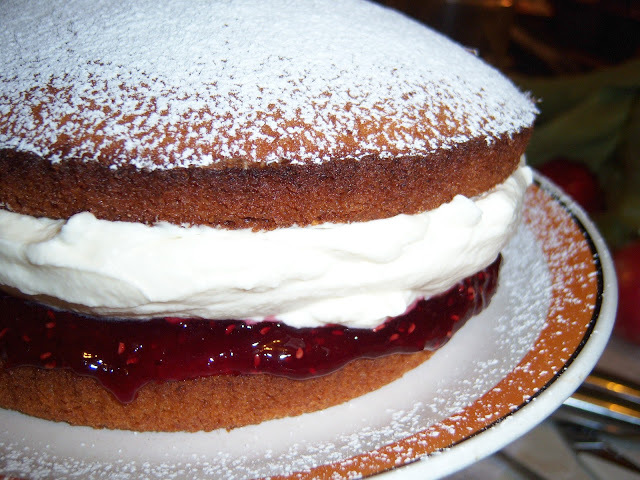 there was a small carton of whipping cream in the back of the fridge, so i used that as the filling for a simple Victoria Sponge cake (i know, i know... i should have taken the cakes out a couple minutes earlier). the whipped cream is flavored with a hint of vanilla and almond extracts and the jam of choice is raspberry (seeds and all). here's to my honeybear's swift recovery.